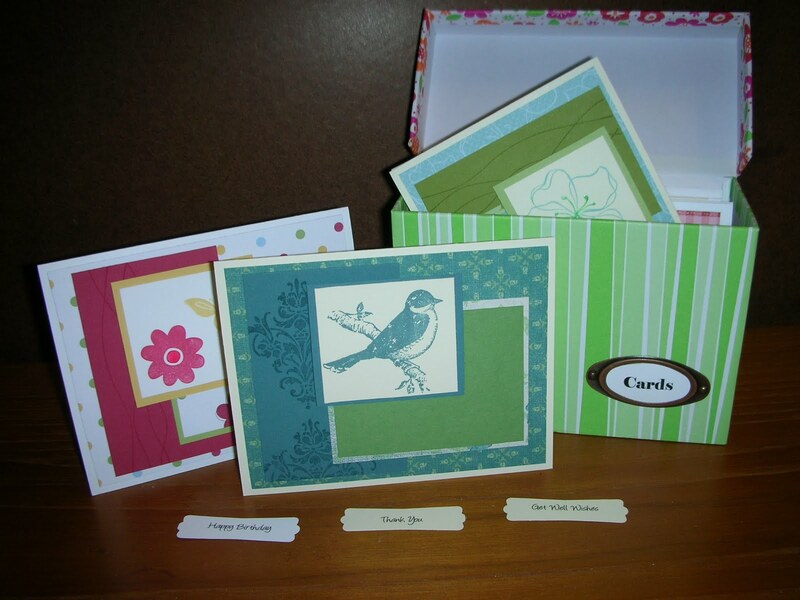 Perfect for a hostess, birthday or thank you gift or just to keep for yourself, we will be altering a recipe box into a Card box which will store 12 cards & envelopes that you will be making as well. The cards will be appropriate for any occasion and you will leave with labels for customizing each card for the appropriate event. Gone is the day when you didn't have a card for the occasion! Just go to your Card box and customize a card! No previous stamping experience required – Mom and I will both be here to assist you. Light refreshments will also be provided. Cost for this event is $25 per person. Space is limited to 8 so RSVP ASAP! I suspect this will be a popular class! 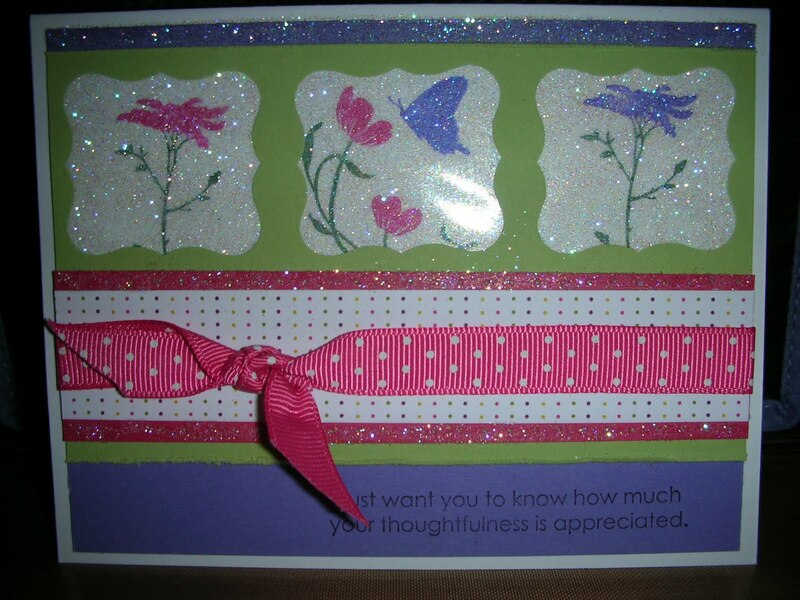 Don't you just love making cards using items found laying around your house? I do! Can you find the household item in this card that we made at a recent workshop? No? Give up? Okay, it is shipping tape! I punched the three windows on the Certainly Celery cardstock using the Curly Label punch and placed a piece of shipping tape across them from the back. 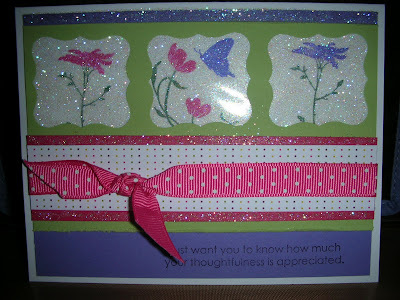 I then added Dazzling Diamonds glitter to the sticky part of the shipping tape showing through the cardstock. Using markers, I colored the images on a piece of Whisper White cardstock and placed it behind the windows. I love the end product! How about you? By the way, were you wondering how I made those windows line up so well? The trick is using another household item - Post-It notes! Punch out the post-it notes making sure to keep some of the sticky portion. Then place them where you want on your cardstock and then punch the cardstock. Perfect alignment every time! Now what household item are you going to use????? Stampin' Up! Announces Color Renovation!!! 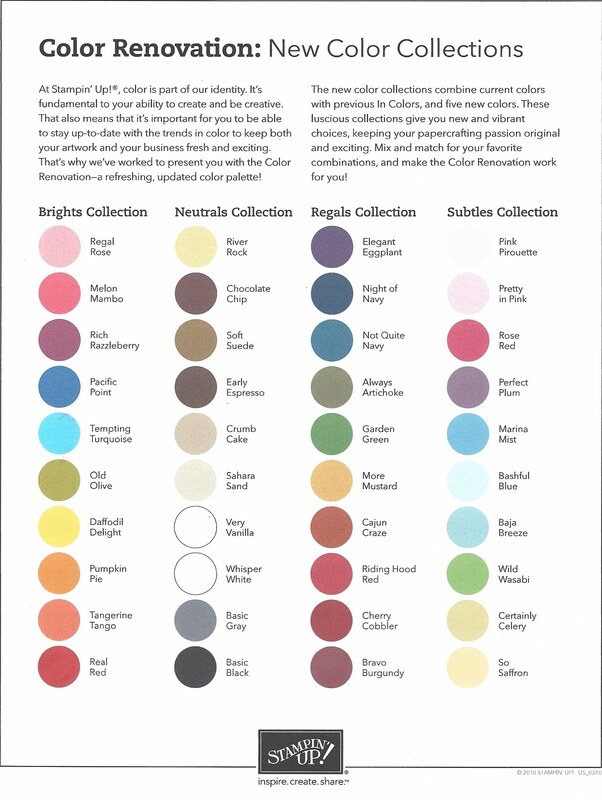 Each color collection will have 10 colors in it which you can see below. There will be 5 new In Colors beginning in July but instead of only being around one year, they will be around for two years. In July of 2011, Stampin' Up! will add 5 more In Colors which means there will be 10 In Colors which retire in two year increments. Five New Colors will be added to the collections: Daffodil Delight, Cajun Craze, Early Espresso, Cherry Cobbler and Marina Mist. Returning In Colors which will be added to the collections: Melon Mambo, Pacific Point, Tangerine Tango, River Rock, Soft Suede, Riding Hood Red, Rich Razzleberry, Wild Wasabi, Pink Pirouette and Baja Breeze. Colors that are saying "goodbye" are: Pink Passion, Pixie Pink, Pale Plum, Orchid Opulence, Lovely Lilac, Lavender Lace, Almost Amethyst, Bordering Blue, Brocade Blue, Ballet Blue, Brilliant Blue, Taken with Teal, Glorious Green, Handsome Hunter, Sage Shadow, Mellow Moss, Green Galore, Gable Green, Barely Banana, YoYo Yellow, Summer Sun, Apricot Appeal, Only Orange, Really Rust, Ruby Red, Cameo Coral, Blush Blossom, Creamy Caramel, Close to Cocoa and Going Gray. 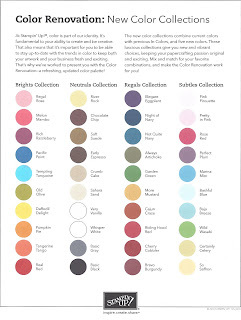 I will miss some of these colors but really look forward to the new collections. I hope you do too! They have announced that they will be offering special bundles to supplement your current collections. The actual kits and pricing will be available in July. Contact me if you have any questions!